This article by Wolfgang Wüster, Bangor University and Giulia Zancolli, Université de Lausanneis republished from The Conversation under a Creative Commons license. Read the original article. The Mohave rattlesnake — poster child for venom variation among rattlesnakes. : image credit & copyright: Wolfgang Wüster Few sights and sounds are as emblematic of the North American southwest as a defensive rattlesnake, reared up, buzzing, and ready to strike. The message is loud and clear, “Back off! If you don’t hurt me, I won’t hurt you.” Any intruders who fail to heed the warning can expect to fall victim to a venomous bite. 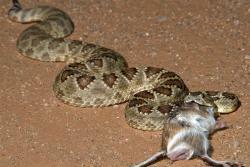 Mohave rattlesnake feeding on a kangaroo rat, one of its most common prey items. : image credit & copyright: Wolfgang Wüster The next step in our research was to test for links between venom and the physical environment. Finally, we found some associations. 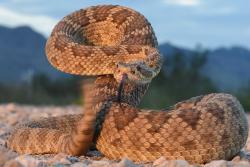 The haemotoxic venom is found in rattlesnakes which live in an area which experiences warmer temperatures and more consistently low rainfall compared to where the rattlesnakes with the neurotoxic venom are found. But even this finding is deeply puzzling.